Often referred to as starlight or fairy light backdrops. Indulge yourself with our striking twinkle backdrops which will offer a unique landscape for your wedding photos and speeches when positioned behind your top table. Our backdrops can be adjusted to your required space and are ideal for covering walls. The backdrop lights can be set to provide a soft subtle twinkle or can be set to static. Our backdrops are of the highest quality, fully fire retardant and PAT tested. If your reception is in a room with little or no natural light our twinkle backdrop will create the illusion of a window and brighten up the darkest of rooms. 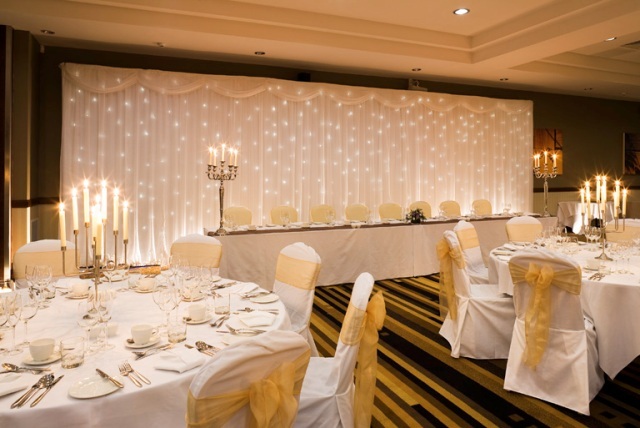 We can further enhance the twinkle backdrops by adding side swags and floor standing uplights that will shower the curtain with your choice of colour, creates a real impact for your evening reception.